This Valentine’s Dark Chocolate Cake is rich and delicious. It is super moist, filled with cream cheese, whipped cream and sour cherries and gets all its flavour from the sour cherries. I wouldn’t say that we get particularly into Valentine’s Day but since everybody is posting recipes, here is a perfect cake if you plan to make one. I made this cake for my husband last October for his name day, just after our 30 years wedding anniversary and even after 30 years of marriage we are still deeply in love and he knows it all year round. There is a little work involved to make this cake but when it’s made with love, it pays off when you see the satisfaction and pleasure when your beloved ones enjoy it. I had to increase the dose of my sponge cake recipe, as I needed more ingredients to make the heart on top. To make the sponge, you can watch a video here. In order to make the Chocolate Ganache, I used 3 heaped tablespoons of Whipped Cream, which I had already prepared and added it gradually until it became the consistency I wanted. I decorated it with Sour Cherries fruit preserve but you can use any other red fruit on top. See how to make sponges here. Sift the flour and corn flour with baking powder and salt. Beat eggs and sugar for approximately 10 minutes till smooth and creamy. Add vanilla and lemon zest and beat. Fold in the flour mixture gently so that the beaten air doesn't escape. Line with parchment paper a spring form 28 cm tin and a smaller one shaped in a heart. Turn gently the batter into the tins and bake for about 25 minutes (the small one) and 35 - 40 minutes (the big one) till done or until a toothpick comes out clean. Turn out onto racks to cool. Cut each cake into two slices each and wet them with the syrup. Whip all the heavy cream together and when peaks start to form remove 1/3 in which mix the icing sugar and vanilla and set aside in the refrigerator. In the remaining whipped cream, add the cream cheese and sour cherries syrup and mix. Put the first sponge cake in the spring form ring and add ¾ of cream cheese mixture in the cake as well as some sour cherries and cover with the second half of the cake. Add a little cream cheese in the middle of the cake in order to attach the smaller one. Add the remaining cream cheese and cover with the second half of the cake. Refrigerate for an hour and then remove the spring form ring. In a bain Marie add the chocolate with butter and honey and when it melts set aside to slightly cool. Then add 3 heaped tablespoons whipped cream and mix until it's consistency becomes runny. 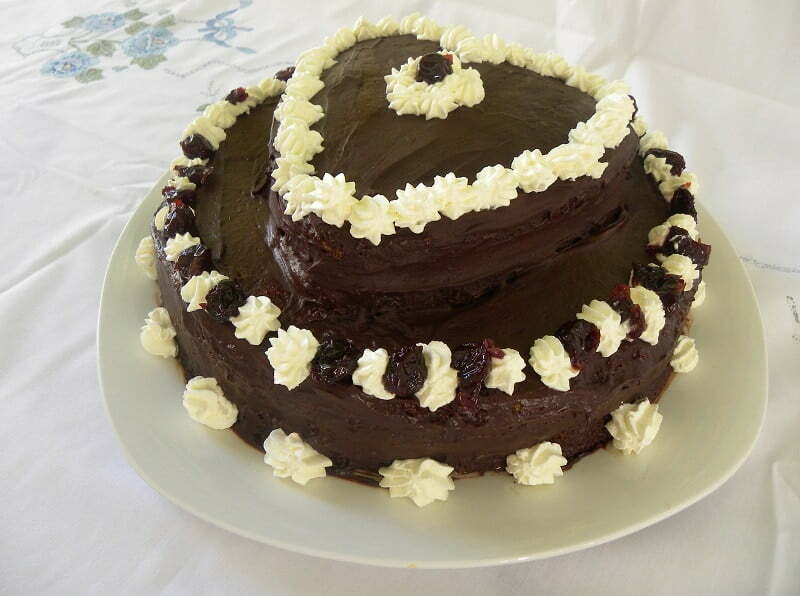 Cover the cakes with the ganache and decorate it with whipped cream and sour cherries. Refrigerate until the ganache is firm before cutting it. This cake looks very tasty. I like the shape of it. Next time, on top of the ganache, try to use fondant. I am sure you will love the result. This is the best cake I have ever seen. I will surely have it for my Valentine this year.